A deservedly popular fly designed by Mr R.S.Austin, a tobacconist of Tiverton in Devon, South West England in 1900. He dressed and sold flies as a sideline. 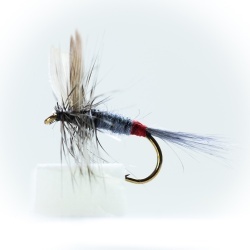 This version of the old 'Tup' pattern is popular when pale midge or mayflies are on the menu. It is fished dry on the water and moved slowly amongst fish that are feeding near the surface. It can be used effectively in these conditions or for high summer when reduced water flow and high temperatures can make the trout very fussy. It is a useful pattern used to represent light colored mayfly like the pale watery or small spurwing female spinners. Mr Austin sent a sample of dubbing with tying instructions on how to tie an unnamed fly pattern which he had found particularly successful in imitating female olive spinners to Mr G.E.M. Skues, father of modern nymph fishing. Skues followed the instructions and made the fly. He spent most of the following September testing the fly on his local water the River Ichen and was so impressed that he published his findings. He also found it was a very effective imitation of a Pale Watery natural insect. He is accredited with naming the fly and suggesting the addition of the crimson seal fur giving the thorax a pinkish hue. The recipe for the pattern was kept secret and thus Mr Austin obtained a monopoly on selling the fly. The article was widly read and lots of orders were placed. “The fly became so popular that Mr Austin became utterly sick of tying it,” Skues wrote in a letter. He was one of two people given the dressing secret by Mr Austin. It was kept a secret until after his daughter, who continued the business, had retired. Why is it called Tup's Indispensable? Well the 'Indispensable' part comes from the fact that it should not be left out of your fly box as it is such a good fish taker. The 'Tup's' part of the flies name refers to a Ram, a male sheep that is used for breeding. In Britain farmers use a sponge or rag soaked in dye tied to the under side of the Ram. In the morning they inspect their flock and see which females have dye stained backs from being 'tupped' by the Ram. The original material for this fly was urine and dye stained wool taken from a ram's fleece mixed with lemon colored fur from a spaniel and a little yellow mohair, replaced later with crimson seal's fur. Do not panic! We use modern materials that are the same color but not as smelly.